16 cyclists successfully completed the Thuso Mandela Cycleride on Sunday 20 July. 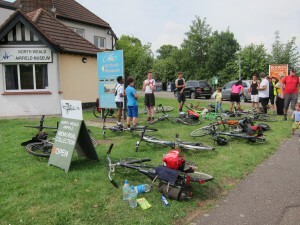 This covered 40 miles from Walthamstow up into Epping Forest to North Weald in Essex. It was quite gruelling with numerous hills and some off road stretches around High Beach. The weather ranged from sunny and too hot at lunchtime, to heavy downpours by late afternoon. The final cyclists returned after 6pm, after a long but satisfying day. There were 2 punctures, and a few gear problems, but no serious incidents. 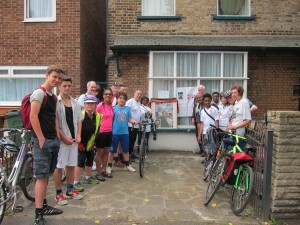 The departure took place at 10.30am from Grosvenor Park Road in Walthamstow. 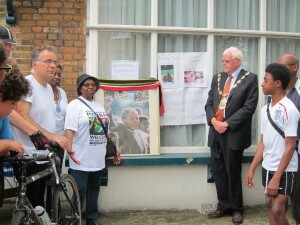 Cllr Terry Wheeler, the Mayor of Waltham Forest, did the official send off. Mmapula Tladi-Small, the Chair of Thuso, spoke about the importance of Thuso’s work. This year marks 20 years of freedom in South Africa, with South Africa’s first free and fair elections taking place in 1994, after decades of anti-apartheid activities. Nelson Mandela was elected President, and his Birthday would have been the 18 July. For many years July was a focus for activities, like the 2 Mandela Concerts at Wembley Stadium, and also numerous cyclerides, during his long period of imprisonment. Thuso recently launched a new appeal to provide lamps to the children and families in South Africa, because children without light can’t study. About 80% of homes in South Africa now do have access to electricity, but power cuts are still common, especially in rural areas. Up to 40% of South Africans still use kerosene regularly for heating, lighting and cooking, which is a highly-flammable and toxic fuel. Others rely on torches with expensive batteries for lighting. Now a new generation of cheap, high-performing solar lights can provide clean, safe lighting and phone charging. These lights cost relatively little, last over five years and require no specialist installation or maintenance. £7.50 pays for a study light, £15 for a family lantern and £35 for a solar lantern and mobile charger. Sponsorship from the cycleride will support this appeal. Donations and sponsorship can be made through the donate button on the website. 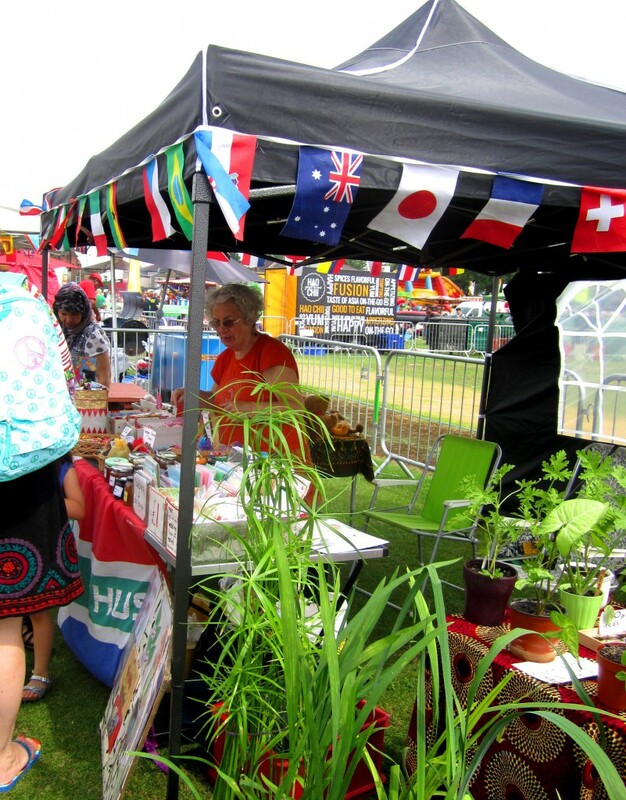 Tania and Alison ran a Thuso stall at the Leyton Caribbean Carnival on Sunday, 20th July. Thuso is organising its first Mandela Sponsored Cycleride on Sunday 20 July. Leaving from Walthamstow at 10am it will include 10, 20 and 40 mile options.This year we are celebrating 20 years of Freedom in South Africa, with South Africa’s first free and fair elections taking place in 1994, after decades of anti-apartheid activities. Nelson Mandela was elected President, and his Birthday would have been the 18 July. For many years July was a focus for activities, like the two Mandela Concerts at Wembley Stadium, and also cycle-rides. The departure will at 10am from outside 37 Grosvenor Park Road, London E17 9PD; many of you know this as the venue for the annual Thuso Garden Party. Cllr Terry Wheeler, the Mayor of Waltham Forest, and Mmapula Tladi-Small, the Chair of Thuso, will be there amongst others for the send off. 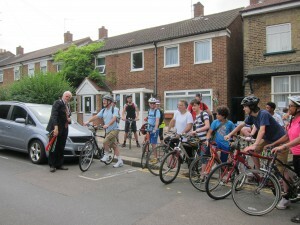 The cyclists will then set off towards Chingford, High Beach and North Weald, on forest tracks, and minor roads into Essex, before returning to Walthamstow. It promises to be a most pleasant ride, and cyclists can still join the ride. The Sponsorship Form and flyer are available by clicking on the links. The Cycleride will be supporting the charity’s new appeal to provide lamps to the children and families we support at schools in South Africa– because children without light can’t study! Help us bring solar lamps to South Africa! By sponsoring, making a donation or becoming a cyclist you can play a part. £7.50 pays for a study light, £15 for a family lantern and £35 for a solar lantern and mobile charger. or 07931 337202. To sponsor cyclists use the donations facility on the website. If you would like to print out a flyer, you can download it here (PDF). If you would like to print out the sponsorship form, you can download it here (Word doc).